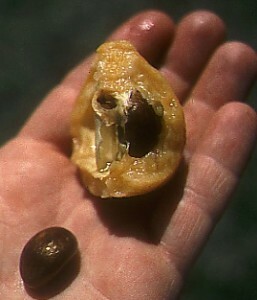 Loquat – Eriobotrya japonica Lindl. The loquat belongs to the Pomoideae subfamily of the Rosaceae, along with apple, pear, quince, juneberry, mayhaw, and medlar. 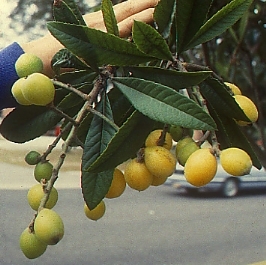 The loquat is a cold-tender evegreen, native to southeast Asia. It has been grown in Japan for >1000 yr, where over 17,000 tons are produced annually. Brazil also has some production near Sâo Paulo. More commonly, it is grown as an ornamental or garden tree in the southeastern US and California, mediterranean countries, and some parts of central and south America. A. Plant: Large evergreen shrub to medium sized tree, to 30 ft. Leaves are linear, large (8 inch), dark green, leathery, with acute tips, appearing whorled on short stems. The dense canopy of whorled, large evergreen leaves creates the overall appearance of a diminutive magnolia (to me, anyway!). B. Flowers: Small, white flowers are borne on terminal racemose inflorescences (about 20 flowers ±). Flowering time is unusual; occurs in November-January, depending on location. Five white petals are subtended by a prominent brown, pubescent calyx which encloses the inferior (epigynous) ovary. C. Pollination: Cross pollination is not essential but increases production slightly. Pollinator = honey bees. D. Fruit: a ovoid pome (1-2 inch); Generally yellow-orange, glabrous skin with red blush. The pulp is white to yellow-orange, very juicy, sweet to subacid in flavor, containing 3-5 relatively large, brown seeds. Fruits are easily bruised and may have an unattractive external appearance. The taste and texture “suggest plum, lychee, grape, and cherry” (Schneider). 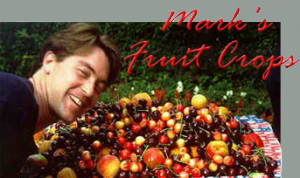 Fruits ripen in March in Florida, May/June in California. Soil – deep, well-drained, loamy soils with pH 6-7. Cold hardiness – Wood and foliage tolerate temperatures down to -11°C (12°F), but flower buds are killed at -2 to -7°C (18-28°F). Because flowering occurs in late autumn, frost kills the open flowers nearly every year when grown outside the tropics, so fruiting is rare outside of Florida, coastal Georgia, and California in the US. 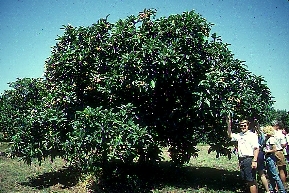 C. Rootstocks: Seedlings of loquats; occasionally quince. D. Orchard design, pruning, training: Trees are spaced about 20-25ft apart in orchards. Loquats are excellent, yet relatively uncommon fruits. Most often eaten fresh, but due to bruising, are rarely marketed this way. Loquats can be found canned in heavy syrup.